3) Excess energy of the exited state ion is removed by the ejection of an Auger electron. A schematic of this process for a KL2L3 transition is shown in Figure 1. 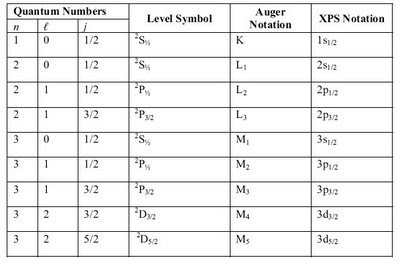 Nomeclature used for the description of Auger transtions are presented in Table 1. Refer to the reference provided for a more in-depth description. Figure 1. Schematic showing the three steps involved in the Auger process. The KL2L3 Auger transition is illustrated. The open circles symbolize holes (absence of electrons) . Table 1. 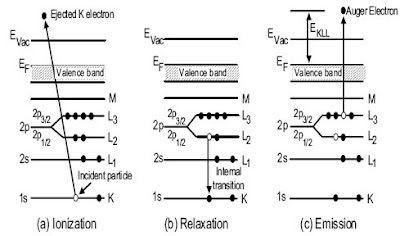 X-ray notation of electron energy states . The higher transitions are N1 = 4s2, N2,3 = 4p6, N4,5 = 4d10, O1 = 5s2 etc., P1 = 6s2 etc. Q1 = 7s2 etc. Richard P. Gunawardane and Christopher R. Arumainayagam in "Handbook of Applied Solid State Spectroscopy" Chapter 10, Auger Electron Spectroscopy, Springer, pp 451 - 483 (2006).